So the Acres trade worked out to an extent. He looked awful and got subbed but he scored well. Dunstan managed to hit his B/E but for 3k I don't care too much. I am looking at trades for this week. I can currently field 18 if all my players return from their bye and the guys that played last week play again. That is not counting Fasolo and Georgiou who could be inclusions but I highly doubt. 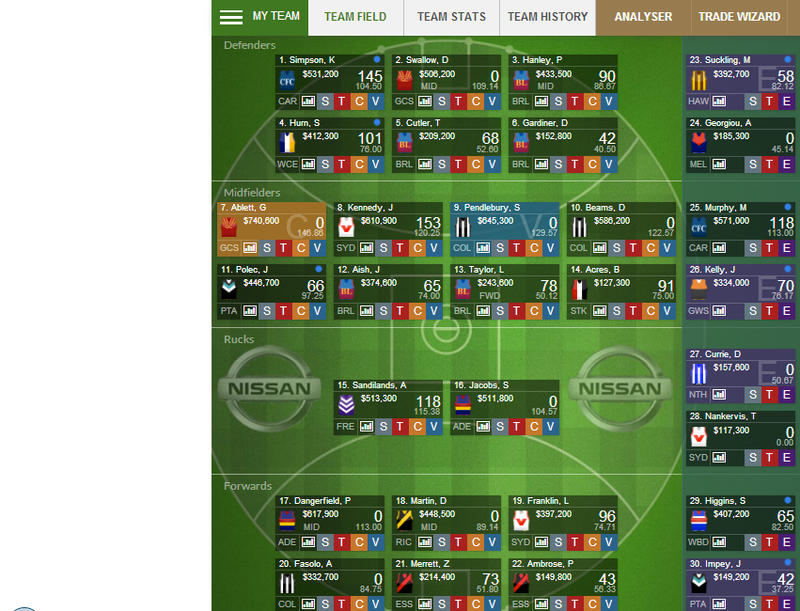 Looking at my backline, I still have Mitchell, I can't trade him to a round 10 guy as I have 4 guys out that week already, it has to be a round 8 or 9 guys. I am not a fan of any of the round 8 guys other then maybe Harry Taylor, but he is a huge risk with how poorly he has been scoring. I am looking at round 9 guys even though they are on bye and I think Hurn is the guy. I make 100k, he has pretty much scored close to 100 every week he has played a full game, he has a low B/E so I just sit him on the bench and it saves me making the trade next week. I am going to get rid of Polec this week as well. Selwood is the guy I really want, but Freo and a high B/E, nah pass. I can probably pick him up quite a bit cheaper later and try and find another option. I am again thinking of going risky this week and going for Nicky Dal. He has the 3rd highest average of the round 8 guys I don't have (Stevie J and Selwood 1 & 2), but with an almost finished midfield I see it as a potential waste of a trade. Not a Tippett fan but he has been named and I only need him for 2 games. It has left me with 17 players next week before trades, 19 this week minus late withdrawals. I have also thrown the VC on Beams for the hell of it. I still have $638,000 in cash which is key for future upgrades and my league opponent this week has Zac Dawson, enough said. I figured I am going to win the matchup, I might as well take a couple of risks to see how I am going to jump in terms of overall. Well done mate - Time to spend that cash over the next couple of weeks. Cameron looming as a nice downgrade for forwards. Cameron is on the radar. The more cash I can get into this side the better. Being limited on trades I need to keep maximising the cash making potential of rookies and trying to pick up under priced players. There is a large chunk of the season to go, so some of the underdone guys like Jack Steven might be worth a look later on. As much as I wanted Dal/Tex, I knew getting Tex in now was stupid while he wasn't on the bubble and when I look at the mids I see better 'scoring options' compared to Dal. I just have this gut feeling he will push over a 115 average, but I see other guys like Joey, Boyd, Rockliff, Selwood, Stevie J, Watson and even Kieren Jack that I want to fit into this side. I think knowing that this is still technically not my side has me thinking risky. A few of the risks I took last season placed me pretty well in the end so I will more often then not go with my gut. Plan looks solid Matt but I'd expect Tippett to get dropped soon but oh well, need 18 on field. Cameron looking very good for a downgrade. I don't know about Tex yet. Tippett was only a two week pickup. It was between him and Georigou rotting on my bench, I figured if I can make 50k and hope he plays next week it is worth it. Aylett wasn't an option with a round 10 bye, Litherland might get a game next week but didn't want to sit on it this week as I will need all 3 next week to try and use my cash wisely. No way Georgiou comes back in with all of the Dees KPD's healthy so he is dead weight, post byes my D8 should hopefully not see the field for a while. That Merrett trade has been a ripper so far. Not only did I make 20k bringing him in, I got rid of Rohan who wouldn't have scored what Merett did in his last two games all season. He should also have a nice little price rise and be a stepping stone to a potential premium in a few weeks. brad, what are you thinking in terms of Jack Steven or Joey? You already know that answer to that Mat Right Brad haha?